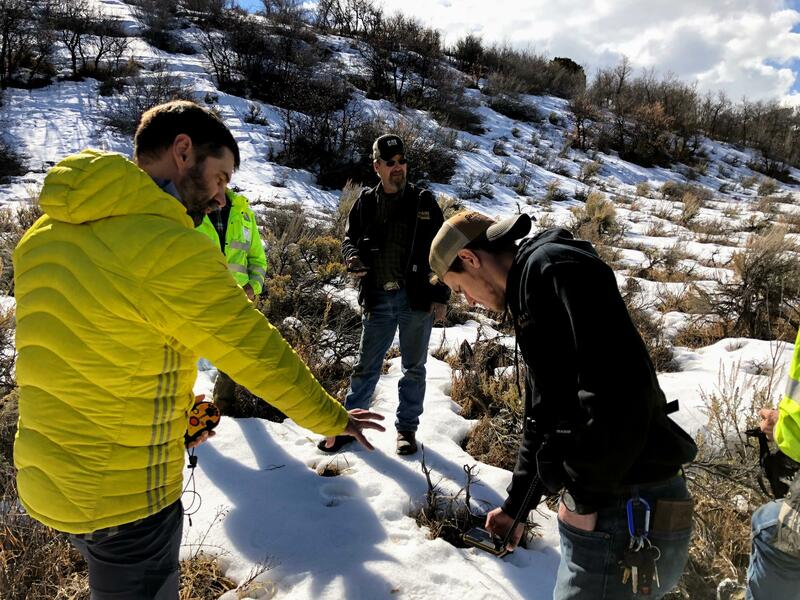 Drivers with Pitkin County's road and bridge department practice locating buried avalanche beacons during their yearly training. Pitkin County’s road and bridge crews keep the roads clear and open during even the nastiest of winter storms. While doing it, they often have to drive through areas that are prone to avalanches. On a dark, snowy evening a few winters ago, road-and-bridge supervisor D.J. Hughes went to work up the Fryingpan. There was a slide covering the road at about mile marker 16. He cleared that slide and was coming back down the road toward Basalt when another avalanche hit the road in front of his truck. "I stopped, was watching what was going on, was backing up, and as I was backing up, there was more snow coming in behind me," Hughes said. He sat in his truck, between the two avalanches that each covered a lane and a half of the road, up to five feet deep and called in to dispatch. Admittedly, though, it was a little scary. "I was a little on edge myself," he said. "I wasn't sure how much more was going to come down, wasn't sure what the snow was like above me, and that's why we have our radios to let everyone else know where we’re at and what’s going on." Hughes was able to clear the slides and make it safely back down the narrow road. But in the intervening minutes, he said it was “very comforting knowing that I have that other person on the other end of the radio that knows I could be in danger and with our training and stuff that we do, with the beacons, they'll find me." The training put on by Mountain Rescue Aspen covers both the fundamentals and the practical elements of avalanche awareness. Pitkin County’s road-and-bridge crews plow and maintain 140 miles of roadway, and their routes include several areas that see regular avalanche activity. Bruce Gordon is a volunteer with Mountain Rescue and has been helping with these trainings for several years. "It's really a critical situation," Gordon said. "We're having bigger snows, wetter snows, and there are certain areas up Castle Creek that have slid numerous times, and it's becoming more of a problem." There is a two-mile stretch on Castle Creek road that is marked as an avalanche zone, where vehicles are not allowed to stop or park because of increased danger. Gordon lives up that valley, above the avalanche zone. "And I've been stuck up there because the avalanches closed off the road for a number of days," he said. When storms hit, it’s the Pitkin County crews that plow the narrow valleys, like Castle and Maroon Creeks and the Fryingpan. And they are there to clear any slides that cover the road. All drivers wear an avalanche beacon while they work, and it’s important that they know how to use them. "These guys are at risk, and I think it's really important that they're being mindful of that risk and taking precautions and doing a lot of good training for it,” Gordon said. John Young, left, is one of Mountain Rescue Aspen's volunteers who help train Pitkin County's road and bridge crews on avalanche safety. Their training starts with understanding the avalanche potential and staying on top of conditions and forecasts from the Colorado Avalanche Information Center. Gordon discusses having keen situational awareness, too — paying close attention to your surroundings. "So they've got to be constantly making decisions out there in the field, and hopefully they’ll be more aware, thinking about avalanches, and the equipment that they’ve got with them that can save them,” he said. Much of this training is spent outside working with that equipment. 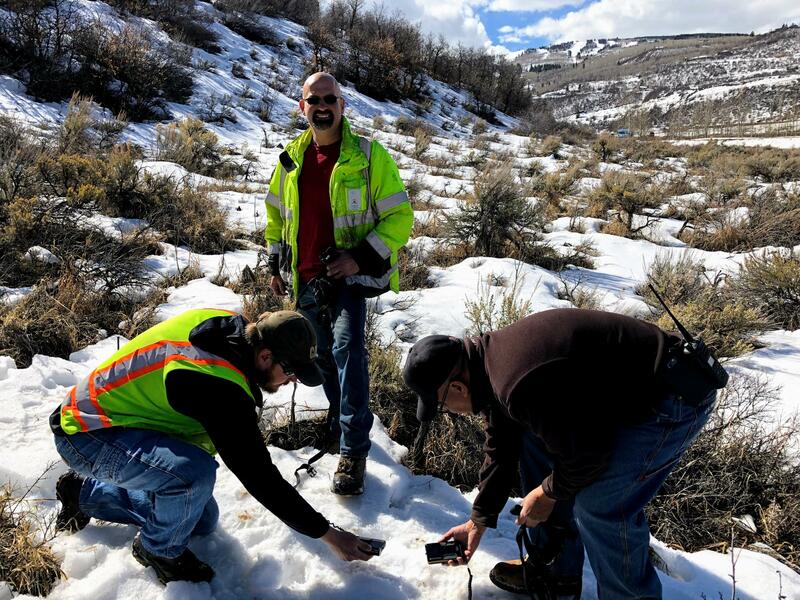 The crews stomp through the snow, practicing locating transmitters that the Mountain Rescue volunteers have buried. This simulates finding someone who has been buried in an avalanche. Scott Mattice is road-and-bridge superintendent. He said when he started with the department, wearing a beacon was just like putting on a belt everyday, but not everyone on the team knew how to use them. "If they're using any of our tools, for that matter, anything we have, I want the guys to know how to use it," he said. In Mattice’s first few years with the department, they would improvise beacon practice in the parking lot of public works. "Hiding the beacons behind truck tires and on top of things," he said. "This is much more realistic now. We're actually stomping through the snow and kind of doing a grid search." It’s not unusual that a plow driver will come across a slide covering a road. That happens with just about every big storm, the crews say. They haven’t yet had to use their equipment to locate someone buried in an avalanche, but Mattice said his crews are starting to see some changing patterns — like ski tracks in chutes up Castle Creek and the Fryingpan that used to be untouched. He thinks this could have implications for the job. "The reality of us coming around a corner and seeing a snowbank with a ski sticking in it, might be our reality now," Mattice said. If that ever does happen, they’ll be prepared and well-practiced. 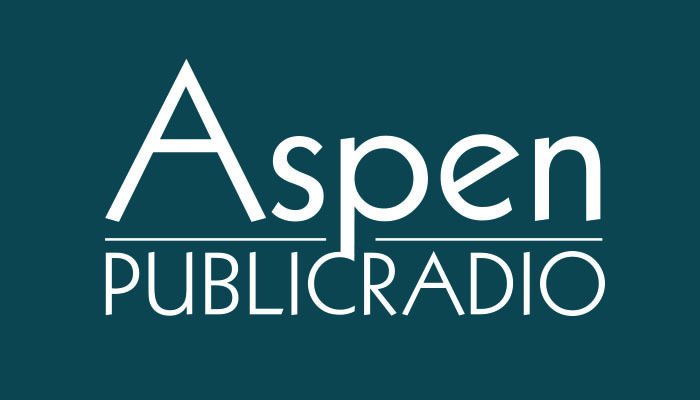 Aspen's snowpack is about two thirds of average, and while skiers everywhere are hoping for more snow, those headed into the backcountry rely on the Colorado Avalanche Information Center (CAIC) for data about avalanche conditions.